How Late in Winter Can You Plant Amaryllis Bulbs? What Is the Meaning of the Amaryllis Flower? Amaryllis bulbs are one of the larger and more dramatic flowering bulbs available in the marketplace today. 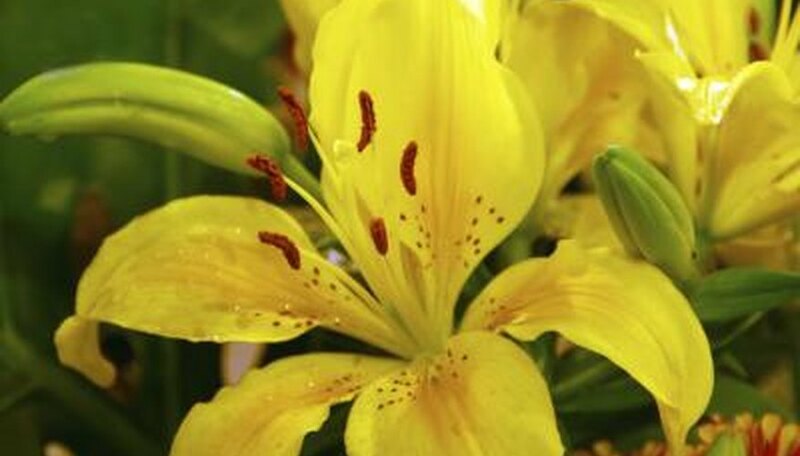 Whether grown indoors or outdoors in the garden soil in temperate to warm climates, these flowers perform well for many years under light but consistent care. They typically require little pruning save the removal of spent flowers and damaged or dying top foliage. Deadhead or cut away each individual flower head that blooms on top of the amaryllis flower stalk as each flower fades. Leave the remainder of buds and fresh blooms on top of the stalk in place. Prune away any dead, badly damaged or disease stricken leaves surrounding the amaryllis throughout the growing season. Place cuts at the base of the strap-like leaf just a 1/4- to 1/2-inch above the crown of the bulb. Shear off all top foliage down to the crown of the bulb in the late fall or winter in climates where the top foliage does not remain green. Compost or discard the stalk in the trash. Mulch over the top of the sheared bulbs with an organic material, such as compost, shredded bark or leaf mold, to protect the bulb from cool temperatures and drought. Place the amaryllis bulb vase in the sunshine. A windowsill is ideal, but any area of the home that receives sunlight and temperatures above 60 degrees F will suffice. Add water to the vase as it evaporates. The water level should remain 1 inch below the bottom of the bulb. Do not allow the bulb to sit in water or it will rot. Change the water completely once a week. Drain the old water and add clean, room-temperature water. Turn the vase daily to keep the amaryllis growing upright, as it will have a tendency to lean toward the sun. Give it a one-quarter rotation every day. 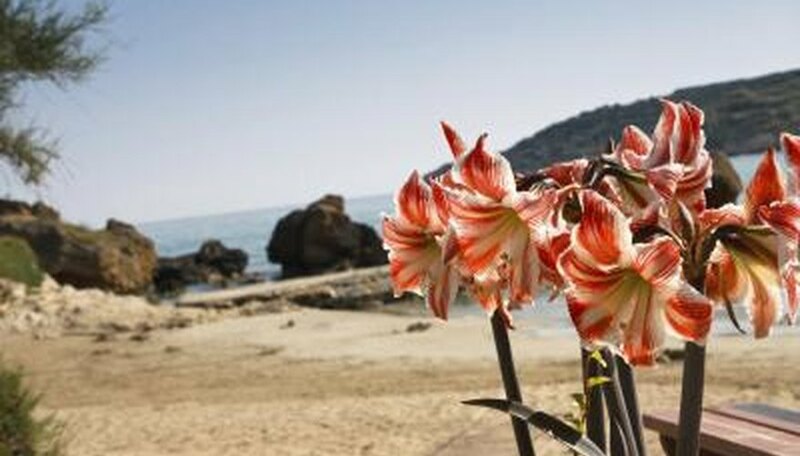 In its native habitat, the amaryllis blooms during nine months of wet weather and goes dormant for three months of dry weather. The average blooming period for the amaryllis is from early winter to early spring. A single bulb produces as many as three flowers at one time. Once pollinated, seedpods form rapidly in the flowers and mature in about four or five weeks. Plants brought inside in the fall can overwinter inside and produce blooms during the next flowering period. Bulbs that are forced should be planted about eight weeks in advance of expected bloom time. 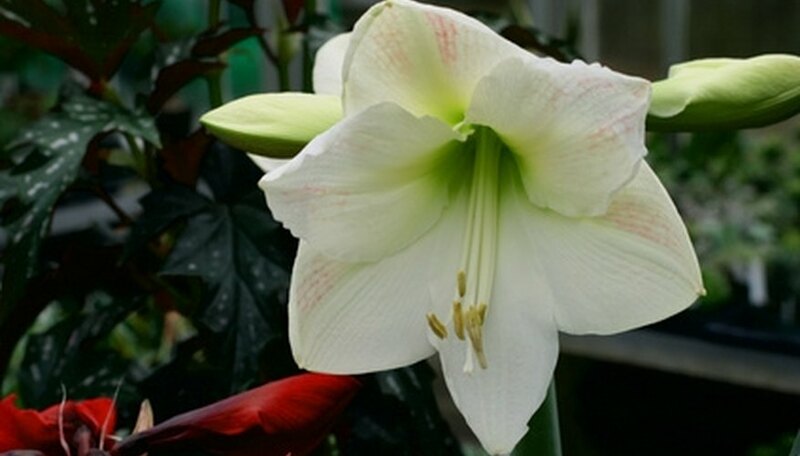 The amaryllis is sometimes referred to as the Hippeastrum, which means "knight star". 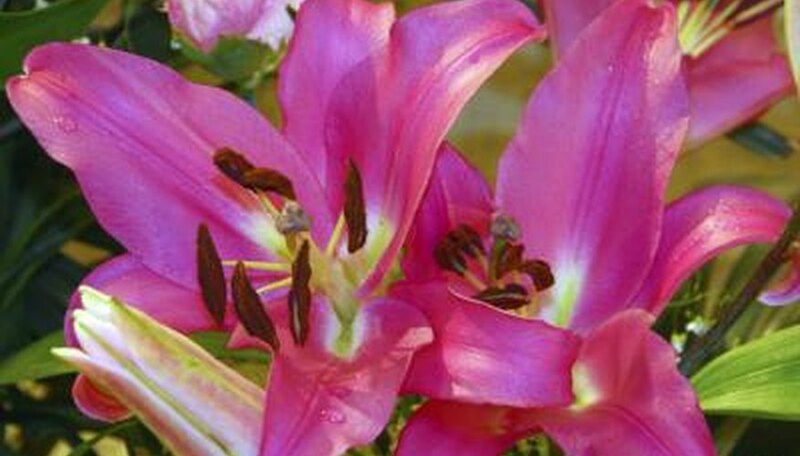 It is also called "'Naked Lady" and "Resurrection Lily." The amaryllis is a native of South Africa. The blooms of the amaryllis are large and weighty. Their weight makes it difficult, at times, for the stems to support them. The stem of the amaryllis can soak up a lot of water. This water supply within the stalk makes the amaryllis a good flower to use in decorative arrangements. The amaryllis is frequently used as a Christmas decoration. 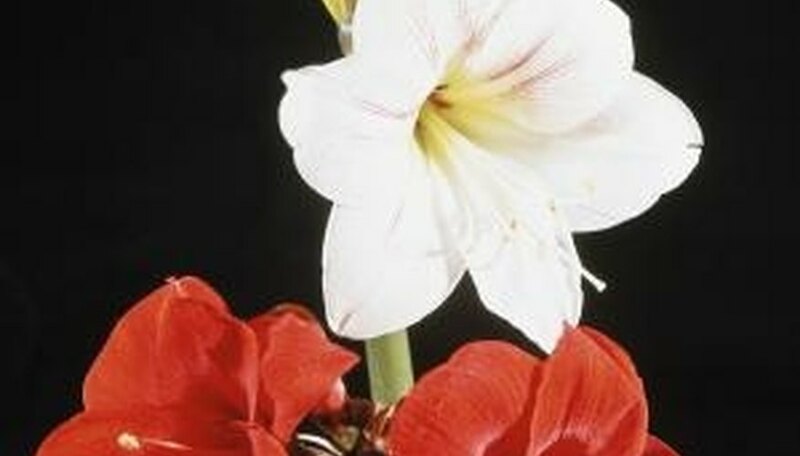 The longevity of an amaryllis bulb enables it to produce blooms for up to 75 years. 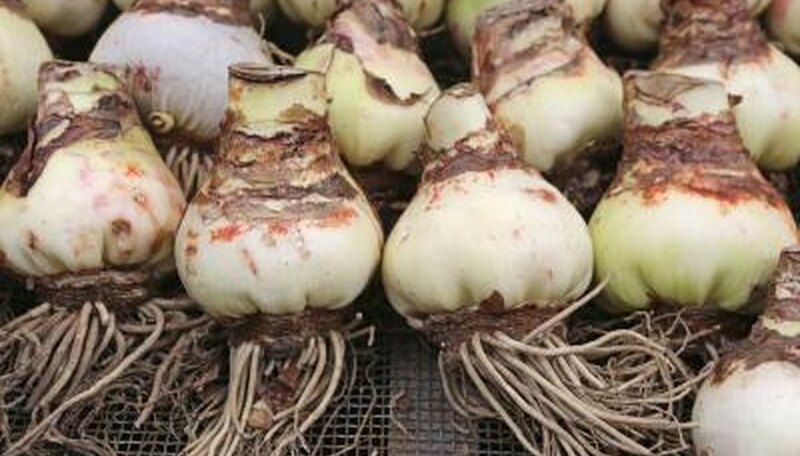 Look for small or dwarf amaryllis bulbs. Larger bulbs tend to produce longer flower scapes. There are dwarf varieties that will naturally remain shorter. Place your amaryllis bulb in a large container for stability, since bulbs of any size grown in short containers can topple. Add additional weight by placing gravel in the container to keep your flower from toppling. Grow your amaryllis in a good environment, since the wrong care causes the flower to grow taller. These plants like cool rooms and become leggy if grown in a hot environment. They become tall if grown in low light conditioners, so make sure your plant has access to light to help keep it on the short side. Cut back on fertilizing your plant when it begins to grow a flower scape. Choose a low nitrogen fertilizer, since excess nitrogen promotes tall flower stalks. Once your amaryllis finishes blooming, resume fertilizing. Fill a shallow container with 1 to 2 inches of potting soil or perlite. A container with a lid will make it easy to ventilate the seeds as moisture increases. Drag a pencil through the soil to create a trench 1/2 inch deep. Place each viable amaryllis seed 1/2 inch apart in the trench and cover with soil. Viable seeds have a hard bump on one end and it is essential that this bump is fully covered by the soil mix during germination. Use a spray bottle to fully mist the soil and seeds with clean water. Over the period of germination, mist soil regularly to prevent seeds from drying out. Cover the container with a lid and place in a warm area with partial sunlight. Seedlings should emerge within the first four weeks and can be transplanted once several roots have grown. Plant amaryllis bulbs in pots any time from October to April. Flowers appear seven to 10 weeks after planting. Select a sunny location that gets afternoon shade. Dig the area and add compost and other necessary soil amendments depending on the soil type. Amaryllis prefers rich, well-drained soils. Add one part sand and one part organic matter to one part soil if the soil is clay-like. Trim brown and dry roots off the bottom of the bulb. Plant the bulb so that the bottom 2/3 is under ground and the rest is above ground. Space the bulbs 3 to 4 inches apart. Water and feed as you would other flowers. Ensure that the bulb gets about 1 inch of water per week. Fertilize once a month with water soluble plant food per package directions. Remove the flower stalk after it has bloomed, if desired. Allow the leaves to remain on the plant until they have completely yellowed. Dig up the bulb several weeks before the last frost in Zone 8. Contact the closest university agricultural extension or talk a nursery staff member for the dates. Store the bulb in a cool, dark place until spring. Replant the next spring when the days are warm and it's above 60 degrees F at night. Spread a piece of newspaper on to your work surface. Place the plant pot on to the paper. Fill the pot with several inches of the soil included in the kit. Place the amaryllis bulb, pointed tip up, in the center of the soil. Cover the amaryllis bulb with soil, leaving the top one-third of the bulb exposed. Firmly pat down the soil. Water the soil without getting moisture on the bulb itself. Place the pot in a sunny location away from cold drafts. Feed your amaryllis grown in outdoor containers or house plants once every five to six weeks with a solution of balanced, liquid plant food and water. Use only half of the recommended dose of fertilizer in a full application of water. Pour the solution over the soil evenly and allow the excess solution to drain away. Fertilize your garden-planted amaryllis with a good-quality granular bulb fertilizer or a low-nitrogen general purpose fertilizer such as a 6-12-12 formulation. Keeping the nitrogen value lower will boost blooms and reduce leggy foliage growth. Apply according to the package dosing directions and water in well at application. Feed your garden-grown amaryllis bulbs once in the spring when new green shoots first appear. Feed a second time when the stalk is roughly 7 inches tall and a third time immediately after they bloom to recharge the bulb for next year's flowering. Cut off all of the flower stalks 2 inches above the bulb using hand pruners; wait until the amaryllis plant stops producing flower blooms. Do not cut the leaves of the plant. Place the amaryllis pot in a sunny windowsill that receives bright sunlight. Water the plant when the soil in the pot feels dry to the touch. Dig a hole in a sunny outdoor location that is large enough to accommodate the entire plant pot in June. Place the pot into the hole and fill in the hole with additional soil. Apply a liquid fertilizer to the area using the mixing instructions on the fertilizer packaging. Water the area once per week with 1 inch of water if no rainfall occurs. Dig up the amaryllis pot before the first frost occurs in your area. Cut off all dead leaves 1/2 inch above the bulb using hand pruners. Move the amaryllis to an indoor location that is dark and maintains a constant temperature of approximately 55 degrees Fahrenheit, such as a basement. Leave the plant in this location for at least six to eight weeks and do not water it. 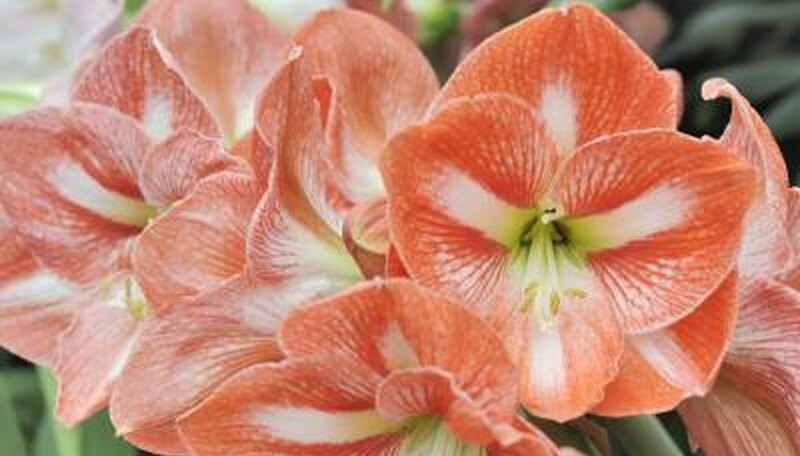 In Greek mythology, Amaryllis was a shepherdess who loved Alteo, a shepherd with Hercules' strength and Apollo's beauty. However, Alteo only loved flowers. He'd often said that he would only love a girl who bought him a new flower. So, Amaryllis dressed in maiden's white and appeared at Alteo's door for 30 nights, each time piercing her heart with a golden arrow. When Alteo finally opened his door, he found a crimson flower, sprung from the blood of Amaryllis's heart. 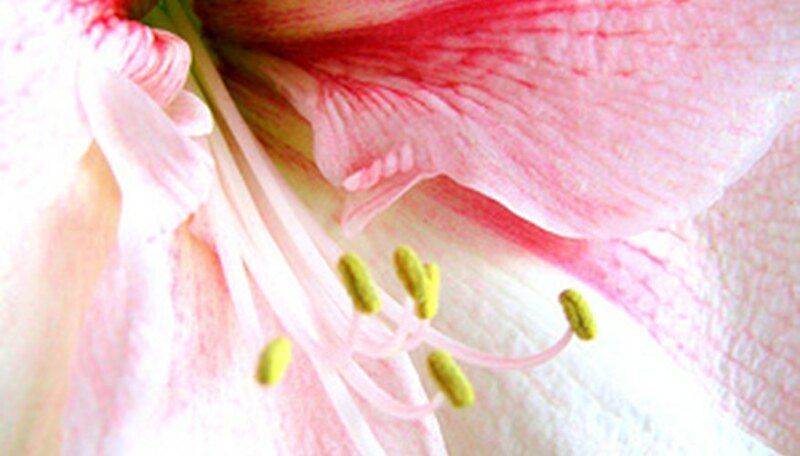 The word "amaryllis" comes from the Greek word "amaryssein," which means "to sparkle," referring to the bloom. Today, the amaryllis symbolizes pride, determination and radiant beauty--the kind that emanates from an inner source and flowers outward. Amaryllis has tall, thick stems and large, colorful flowers. Bloom colors includes red, pink, white, cream, orange and striped and variegated shades of several other colors. 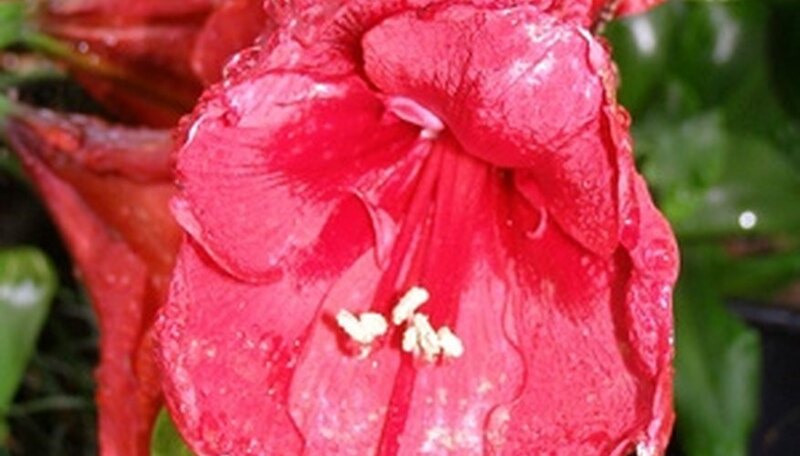 The amaryllis is native to South Africa, the Americas and parts of the Caribbean. It was discovered in Chile in 1828 by Eduard Frederich Poeppig, a physician and plant hunter from Leipzig, Germany. An amaryllis bulb can produce flowers for up to 75 years. Place the plant in a sunny location within the house. Amaryllis like direct sunlight and a warm environment while they are growing. They will bloom earlier if they have a constantly warm home. Amaryllis prefers a temperature of around 64 degrees F.
Pour water into the container around the pot. Do not over water amaryllis. One of the most common mistakes is drowning the roots, which causes mould to grow under the soil. For best results let the plant draw up as much water as it wants from the tray around the pot. When it has stopped drawing the water, empty the excess out. Poke a stick into the soil close to the plant's base to support it as it grows. Do not let the plant lean to one side, as it could snap. Move the plant out of the direct sun once the blooms appear. Snip off the flowers when they die. Remove the flowers near the top off the plant as they wilt. When all the blooms have finished, cut the stalk off the plant around 2 inches from the base. Put the plant back in its full-light location. Some plants will produce a second round of flowers if they are well cared for.